Now, when we have our Base64 decode function, we can start extracting preview saved in active document with help of metadataPreferences. One thing that we have to keep in mind is that XMP node name was changed in CS5. In pre-CS5 node name is Thumbnails and in CS5 is PageInfo, so we have to keep script working we have to check for both values. Dont worry, file can’t have both nodes. Keep in mind that decode time will increase with preview size. For more info how script works, read coments inside script. 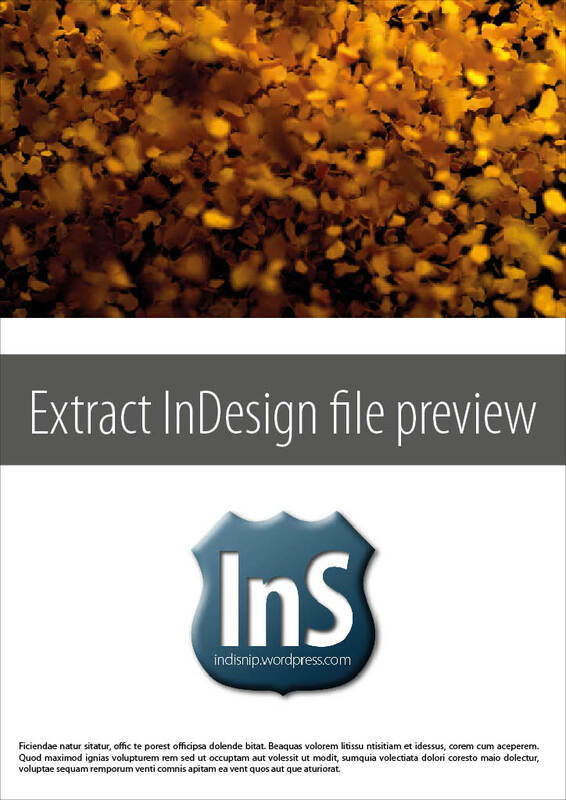 If you place PDF, AI, INDD file into InDesign, you can also extract previews saved in files. This time, we have to use ExternalObject because itemLink.linkXmp.countContainer is not working (I don’t know why)! For more info about ExternalObject check these posts: Extract Metadata with Adobe XMP [Part 1] and Extract Metadata with Adobe XMP [Part 2]. Structure of this function is almost the same as previous. Well, that’s it, hope you learned something. Aha — I hadn’t realised that that other one didn’t work in CS5. But that doesn’t matter as your example is much better! I was wondering if its possible to do this with objective-c without using QUICKLOOK plugins that generator the previews. Thank your for you time. Curious though, how CAN you set how many pages of preview you want InDesign to create and save? Unfortunately, there is no way to set number of pages through scripting.